If you don't have kosher salt, use 1/2 teaspoon table salt. 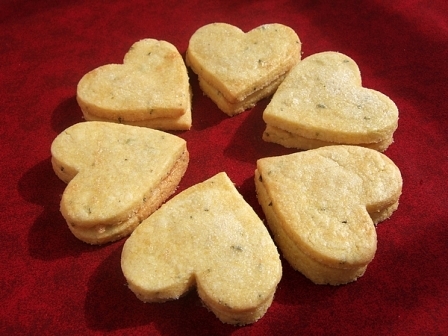 Note that not all the sugar is used in the cookie dough; some of it is set aside after being flavored with rosemary, and used to decorate the tops of the cookies. Preheat oven to 325 degrees. Line two cookie sheets with parchment paper or silicone liners and set aside. Remove 3 tablespoons sugar, sift it through a fine sieve to remove rosemary pieces, then set aside. Mix until dough just comes together; it will be stiff. Turn dough out on a lightly floured counter and knead once or twice if necessary until it holds together. Roll to 1/4 inch thickness and cut with your favorite Ann Clark cookie cutter, then transfer cookies onto prepared cookie sheets. Whisk egg white with 1 teaspoon water until frothy, then brush onto cookies and sprinkle with reserved sugar. Bake 10 to 12 minutes, until lightly colored. Let cookies cool slightly on cookie sheets, then transfer to wire rack to cool completely.